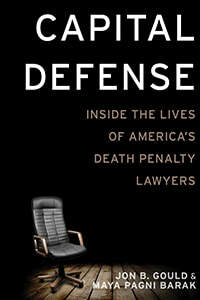 ​Based upon over 60 interviews with capital defense attorneys from across the country, Capital Defense: Inside the Lives of America's Death Penalty Lawyers (2019, NYU Press) explores the challenging practice of death penalty defense. Among other topics, the book covers issues of race and gender, the attorney-client relationship, and the effects of capital work on those involved. ​"A thoughtful, immensely readable, and deeply researched book about the extraordinary lawyers who represent the condemned in the United States. The authors have made a significant contribution to sociology, criminology, legal ethics, and the growing scholarly work on professional identity. This book captures the world of capital defense like nothing I’ve seen before: the courage and humility of the lawyers; the grimness of the setting; the moral urgency of the work. The capital defenders whose voices ring throughout this book are inspiring. They are fighting the good fight for the most desperate and despised among us—in the most challenging and chilling of contexts. You can feel their passion, pathos, and pride of these lawyers long after you finish the book."